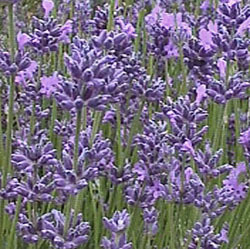 This cultivar of English lavender has more space between the whorls of flowers on the long stems, giving the flowers an airy appearance. The nice stem length and color make it a good choice for cut flowers. It also blooms again in the autumn. The calyx color is dark purple; the corolla is violet.